With a death rate statistically higher than soldiers in the Iraq war, why would anyone risk their life to climb Mount Everest? Photographer Aaron Huey points his camera at the unsung heroes of mountaineering—the Sherpas. Sherpa does not mean to carry something. It's an ethnic group, it's not a job. I wanted to know about the Sherpa. And reveal a part of their soul and their life and their vision that we don't normally see in those adventure magazines. Um... I gotta comment on this one really quick. This is Danuru Sherpa. He became a really close friend of mine and was my guide in the mountains. And he is checking Facebook on his iPhone. I'm not kidding, it's not like my opening joke It's what he is actually doing. You can get really, really good full-bar service at Camp One on Ama Dablam at 21,000 feet. Sherpa does not mean to carry something. You know, we got all kinds of packs, stuff called the Sherpa. Baby carriers called the Sherpa... It's an ethnic group, it's not a job. These guys are not Sherpas. They're porters and they are of a different ethnic group. They are the Rai ethnic group, from lower in Nepal. The Sherpa's work begins here, begins at base camp. You can see porters unloading these massive packs down here in the bottom of the frame. And it's from this point on that the Sherpa's job begins. They carry the loads up through the really difficult terrain. The terrain that requires the crampons and the ice-axe as they go through the Khumbu Ice Fall twenty-thirty times in a season. A lot of these loads are upwards of 150-pounds. If you shove that whole backpack full of oxygen canisters it's incredible weights, more than... more than the body weight quite often. The work the Sherpa are famous for is this high altitude work. This is Ama Dablam Camp Two. This is one of the most dramatic camps in the world, That you can only fit five or six tents. They're all at a little bit of an angle. It's the last place you can sleep before you get into the slopes that can really avalanche off on that mountain. And I want to put in one like personal point of view photograph to show you what I see. What I have to do to make these photographs. I'm not a mountaineer, so these were... this was a new environment for me. This is the, this is one of those tents right there. I'm kinda walking past one that's right below them... to cross this little bridge there. Back at base camp the Sherpas gather with their expedition team, to discuss their roles on the mountains. Who's gonna set up Camp One, who's gonna take down Camp Two... who's gonna carry the kitchen gear who's gonna carry all the Western climber's stuff. And in the case of this meeting they're actually discussing who is going to take down the dead body of a Bangladeshi climber that was left on the summit. The family had paid this company to try to go back and retrieve it. One of their main jobs, besides carrying these heavy loads above base camp is also essentially the herding of the human cattle. You know, we've got these big lines of people going up these ropes and on a lot of these Himalayan peaks they go almost all the way from the base to the summit on many of the Himalayan climbs. And these are rope systems that a client can clip into with an ascender and just keep putting one foot after another all the way to the top of the mountain. And quite often people will go up incredibly difficult looking faces and dangerous faces with the help of the Sherpas just because of these ropes. You can see in this image, a Western climber I think this guy's... this looks like a French-German group. He didn't know how to use his ascender and he's being taught 100-meters below the summit. His Sherpa helper actually had to take away the ascender and show how to unclip it and reclip it on. And then actually made a couple of pulls for him so he could get up a couple of feet and then you know, if this on Everest you start having that bottleneck and hundreds of people pile up. You know, climbers like that will often choose this particular mountain as their first peak. And will actually have to climb below that hanging glacier over there to the right. Once the camps get established, at these higher altitudes the guides, these amazing athletes they kinda snap into a new role. It's really like kitchen helpers. They're boiling water and cooking food and taking care of everybody. And it was amazing for me to watch these athletes doing this kind of work, was like watching the NBA All-Star team like, waiting hand and foot on wealthy clients. It's like having Michael Jordan or LeBron James like, serving you, like, cereal in bed while you're still in your sleeping bag. 'Cause these guys they really are some of the best athletes in the world. And they are spooning this dude's sugar. And then asking whether he wants butter on his toast. And this happens because they pay the money for that. On Everest we're talking 40 to 120 thousand dollars. For me, this story was about this guy. It was not about the famous Sherpa, it's not about the guy that has all the big sponsors, it's not about the world record holder, it's about, kind of the blue-collar worker of the Sherpa world. The guy that just does the work to pay for his family. This guy has maybe climbed Everest two, three, four times. He wants to pay to get his kids through school. And he is gonna go risk his life to do that. Death rates for Sherpas working in the mountains on these expeditions statistically is higher than the death rates of US soldiers in the Iraq War. So, pretty dangerous job. But at the end of the day this is just about the money. A lot of these guys really don't want to do this job. They do it because there is a river of money running by their villages and the only way to get it is to jump in and follow it all the way to Everest. This was a surprising scene I also saw on pay day. It was a little gambling and what was surprising was that they were some of these guys were playing with $100 bills which would be like playing with $2000 bills here. It was a lot of money to be messing around with. But I guess they were celebrating the fact that they had survived. At the end of the Everest season, though I followed down my Sherpa guides and friends because I wanted to go into the villages to see what their daily life and culture looked like. This is Namche Bazaar. It's really the hub and the heart. It's where everybody kind of comes in. It's the center of trading, it's the last place to buy all of your gear. Some people might even helicopter into this place. It's a tourist town full of hotels, restaurants. It's probably tripled in size over the last ten years. Twenty years ago there were none of these tin roofs. It's really big money is running through this village because so many people are on this trail and coming into the mountains. But I also got off the beaten track a little bit. This is the village of Phortse. It's not on the main, main path. And this town stands out because it has the record for the most Everest summiters. Not the most summits, I believe that's Thame but Phortse has 60 people that have summited Everest. And that's nearly every home... in this village has somebody who either actively works right now or has worked on the mountain. You know, these are really quiet villages. This is the village of Thame where people grow potatoes, herd yaks. There aren't a lot of other options for making an income besides the mountain. Running a tea-house, running a lodge those are kind of the dreams. A lot of people save up their money to start up a tea-house so they won't have to keep working in the mountains. Life is really quiet and slow in these places. With the exception of the heated volleyball matches that happen almost every day. They were awesome to watch they were super serious about volleyball. This is Sherpas versus porters. 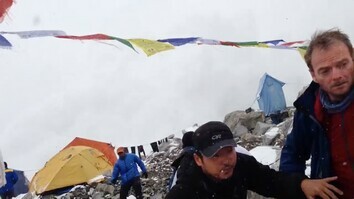 I saw several of these matches that were Sherpa on Sherpa where every single member of both sides had summited Everest. Those were cool to see. You know, whole games of Everest summiters from the age of 16 to some of the guys in their 50s still doing it. This is like the new face of Everest climbing. That guy on the left I think was the youngest guide in the last handful of years. He had just turned 16. This is, now we're going three generations back. This guy climbed, this is Karma Tenzing. He's 77-78-years old. He worked with Sir Edmund Hillary on expeditions in the 50s. And then in the 60s and 70s he helped Hillary put together roads, bridges, schools, a lot of the work projects that he did when he returned. And Hillary, who you can see in this picture here, he was really a model for the Western-Sherpa interaction for a kind of ideal form of that. He returned and gave back to the community and he is still honored for his charitable contributions. This is at the anniversary of the school he started in Thame. After the climbing season, I wanted to return with some of the climbers I had met to their homes. 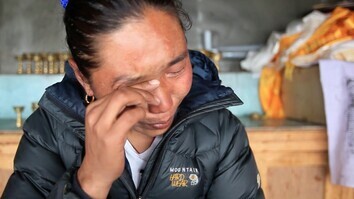 I followed Kalden Fura Sherpa back to his home the day he came back from Everest to see him reunite with his children at the tea-house he runs with his wife. You know this is a time for young fathers to reunite with their children that they've left for three months. But there are always the cases where the father, the husband, the brother does not come back. And that's a really hard part of the story to cover. This is Nima Doma Sherpa. She lost her husband Da Rita. 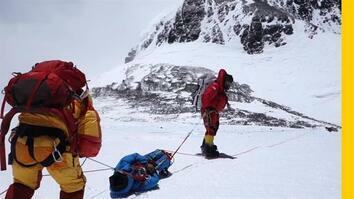 He died of heart failure on, at Camp Three on Everest in 2012. And he leaves behind at the time a two-year old a three-year old and considerable debt. And this is a bunch of self-portraits from last year's Khumbu Climbing School at the Khumbu Climbing Center that Conrad and his wife set up. I really wanted people to be able to take pictures of themselves instead of always having it be me and my idea of what they looked like. One of the great benefits of all of this Western influence and help is in new education programs like this, like the Khumbu Climbing School. They teach basic safety skills. A lot of these young guys I'm talking about 16-year olds, 17-year olds, 18-year olds going up to Everest. They're jumping in the river of money and a lot of these guys they might be able to keep up and they might have the lung capacity and they might be strong but some of these guys actually don't know how to tie knots. And they don't know how to set up anchors. So people leave the school really competent and safe. They practice rescues and wilderness first-aid. All of this ultimately saves lives on the mountain. A lot of the children from these climbers, a lot of these families, they don't want their kids working on the mountain. And they end up saving all their money to send them to Kathmandu and they're gonna attend boarding schools. Like this one, Mount Kailash boarding school in Kathmandu where almost every student here is part of a Sherpa climbing family. And they live a lot of times away from family or with relatives in the city in hopes that education will bring them a different job than climbing. This is Tashi Jangbu, he is 16-years old. He lives away from his family. His father has summited Everest 13 times, and is saving money so that his kid can go to school. And so that the family can build a lodge or a tea-house and kind of move away from this mountaineering industry. While I was in Kathmandu I got to see a really different side of the Sherpa world. I got to go to some dance parties with some of my new friends. You know, their lives are really different than this kind of romantic village life. These guys are living just like my friends. They live a big urban life, they go out, they... some of these guys really love climbing. They travel all over the world. They're professionals. They're part of European mountain guiding associations. So, you do have both sides there. One of the things I really wanted to do was to find a way to bring back how the Sherpas see themselves. This is Danuru and his mother Daki. Daki had eight sons, that all worked in the mountains. Five are still alive. Danuru is the youngest and lives with her and helps take care of her. You see this photo wall behind them, behind Danuru with his summit picture and his family. I found a way through these picture-walls I think to share how they see themselves. How they see their own families that they provide for with this work that they do. Why do they do this risky work? To pay for this. To pay for their... family, for their future. And I wanted to also show, what do they do when the world isn't watching. When our photographers aren't hovering over their shoulders trying to get National Geographic pictures. You know when they go climbing alone with their wife, right? These are photos I could never get. I love these... I love these found photos from their own collections. What photos they carry to the top of the mountain with them. What do they carry up there? And what photos do they return home with, right? To hang on their own walls. I love this one. He brought his kid's stuffed gorilla up there. You know, so I collected these summit photos. I collected hundreds of these. These are the images of the Sherpa, like we're not used to seeing them. It's usually the Westerner we see in the victory pose and I think there's a lot to learn from how the Sherpas see themselves. And to me it's a reminder, you know, in this world full of stories about Western climbers and victories and dramas, you know... that it's not all about us.